Spot are members of the family, Sciaenidae, and are known for the croaking or drumming sound they produce by resonating their large swim bladder. They have 12-15 dusky oblique bars on their upper side and a distinct dusky to black spot on their body just behind the top of the gill opening. Spot occur along the Atlantic coast in estuarine and coastal waters from the Gulf of Maine to Florida; however, they are most abundant from Chesapeake Bay south to South Carolina. They have been collected from the mainstem and all tributaries of Chesapeake Bay and have one of the most extensive distributions of any marine-estuarine fishes in the Bay. Spot are considered to be one of the major regulators of benthic invertebrate communities in the muddy, shallow zones of the Bay. 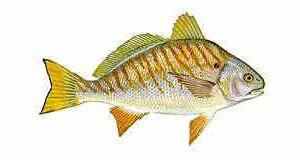 They are also an important food source for other fish species including striped bass, bluefish, weakfish, shark and flounder. Spot migrate seasonally, entering bays and estuaries in the spring, where they remain until late summer or fall when they move offshore to spawn. They mature between ages 2 and 3 at lengths of seven to eight inches with females producing at least 70,000 - 90,000 eggs. Their maximum life span is about five years, although fish over three years of age are uncommon. Spawning occurs in offshore coastal waters in late fall to early spring. After spawning, adults may remain offshore, whereas larval spot will enter the Bay as early as December and appear in nursery areas in April and May. Primary nursery areas for juvenile spot occur in low salinity areas of bays and tidal creeks, but they can also be found associated with eelgrass communities. Young spot grow rapidly over the summer months and by fall, reach an average total length of five inches. Adult and juvenile spot are most abundant in the Bay from April to October. As water temperatures decrease in the fall, most juveniles move to the ocean by December, but some may overwinter in deeper waters of the Bay. In 1987, the Atlantic States Marine Fisheries Commission (ASMFC) adopted the first Interstate Fishery Management Plan for Atlantic Spot for participating states from Delaware south through Florida. At that time there was a major lack of stock assessment and catch and effort data needed for effective management. The Chesapeake Bay Atlantic Croaker and Spot Fishery Management Plan (FMP) was adopted in 1991 and included a number of basic management strategies. In 1994, ASMFC reviewed the status of the 1987 plan and found that it didn’t contain mandatory management measures that would ensure the perpetuation of spot in fishable abundance throughout its range. Though only a couple states now require this plan’s recommended minimum sizes, substantial progress has been made in reducing the bycatch of spot in the southern shrimp fishery. Monitor long term changes in spot abundance, growth rates and age structure. Spot is one of Chesapeake Bay's most important commercial and recreational fish species. Commercial catches come from pound nets, gill nets, and haul seines. Commercial landings exhibit year-to-year fluctuations which may be attributed to the general life history of spot and annual environmental differences on the spawning grounds. Spot is a short-lived species and in most years the commercial catch consists of a single year class. Within Chesapeake Bay, the commercial harvest of spot usually begins during April or May and continues until September or October. The largest commercial catches are reported during the fall when spot are migrating out of the Bay and most spot are landed as bycatch from the pound net fishery in the lower Bay. Spot are one of the species most frequently caught by recreational fishermen in Maryland. The recreational catch of spot from the Chesapeake region (in pounds) usually exceeds the commercial catch from the same area. The annual commercial harvest of spot in the Chesapeake Bay over the past 10 years (1993 – 2002) has averaged 3.68 million pounds with Virginia landing about 90% of this harvest. In 2001, the recreational catch of spot on the east coast of the U.S. averaged 2.01 million pounds. Of this, 4.1% was caught by charterboats, 62% by private and rental boats and 33.9% was caught from shore. To book your trip aboard Light Tackle Charters call Captain Walt at (410) 845-3231 or email him from this site! Remember, your date is not "booked" until a deposit has been recieved.